Name a Nerd’s Plant! – Geek Girls Rule!!! 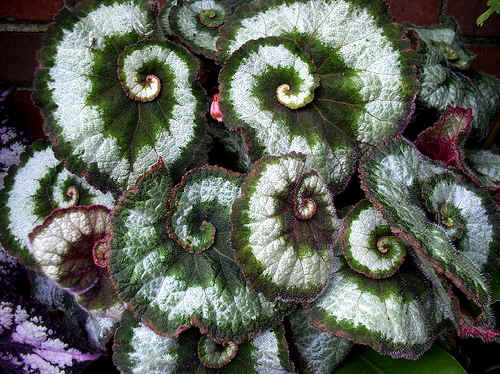 Ok, so I have this plant in my office, an Escargot Rex Begonia. One of my co-workers bought it for me years ago, because I am a dork (and so is he) and the plant’s leaves reminded him of Ferengi ears. I already had a fairly well-established office garden, so he figured another plant would not be amiss. This one looks just like mine, who happens to be named (somewhat unimaginatively) Rex. Rex Begonias are tubiferous, meaning that they have tuberous roots, and how you propogate them is you cut a chunk off the tuber, cover it with a light layer of dirt, water it, give it sun, and if you’re lucky: Bingo! Clone of your old plant!! I had tried to clone Rex somewhat unsuccessfully before, well, not entirely. The clone was doing just fine, but the guy who had it accidently put it on top of a boil out tank, and yeah, well… not so good. So, this year when I re-potted Rex, I hacked off another chunk of his tuber, and gave it another shot. For weeks, nada. Last week I nearly pitched it, but I was in a hurry, running late leaving the office, so I didn’t. Today I was doing some filing and talking to my supervisor, and I looked up and saw this little teeny, fuzzy leaf poking out of the dirt. I HAVE SUCCESSFULLY CLONED REX!!!!! Now, what do I name the clone? I could just do it numerically, but that seems like an even bigger cop out than the original Rex’s name. Rex 2.0, Rex Mod 2. Whatever. My clone needs a better name than that. So name a nerd’s plant. What would you name a plant like Rex? Bear in mind, what you don’t see real well in that photo is that the stems and leaves of the Rex Begonia are covered with a fine layer of red fuzz. The baby leaves are incredibly soft. The fuzz seems to spread out and not be so fuzzy on the larger leaves. Go to it! Nerd Power!!!!!!! I’m actually incredibly excited about my clone of Rex, in case that isn’t coming through. I love this plant, and I’ve not seen another one in the flesh, although they are offered on various nursery sites on the web. I’d go with Tiberius myself. Next Post I have chosen a name!!! !